I want life. I want to read it and write it and feel it and live it. I want, for as much of the time as possible in this blink-of-an-eye existence we have, to feel all that can be felt. I hate depression. I am scared of it. Terrified, in fact. But at the same time, it has made me who I am. And if - for me - it is the price of feeling life, it's a price always worth paying. I want life. I want to read it and write it and feel it and live it. I want, for as much of the time as possible in this blink-of-an-eye existence we have, to feel all that can be felt. I hate depression. I am scared of it. Terrified, in fact. But at the same time, it has made me who I am. And if - for me - it is the price of feeling life, it's a price always worth paying. To ask other readers questions about Reasons to Stay Alive, please sign up. is this a self-help or autobiography? Ebtihal Abuali it's more of an autobiography than a self help. The author talks about his personal experience with depression and what works for him. Matt so simply explains how it feels, he is so darn honest and al FINALLY! A book about depression that makes sense, that those with depression will read and sit nodding their heads and agreeing all the way through it. No psychobabble here (from Psychologists who have never experienced depression) - just real raw telling of Matt Haig's journey with the dreaded black dog. This book should be given or bought by EVERYONE battling depression, or has a loved one battling it. It's everywhere you know. This book is one of the best non-fiction books I have ever read. How deeply it made me feel. This is more than a self-help book or a book that teaches you how to get rid of depression. This book makes you live depression. It gets so deep under your skin, that sadness starts to pour into your veins, your emotions are heightened. This author has a way of making you understand not only the sickness, but every aspect of it, as well. I lived his story with him and to be honest, it was not a happy-go-lucky everything-will-be-okay self-help book. It was a straight in your face kinda book. A story that did not sugar coat anything. It had something strangely comforting, though. He is so accepting; of his sadness, his anxiety, the intense emotions. He does not hesitate to make you understand how depression works. It is no fun, but still, the insights were amazing. Reasons to Stay Alive is a very dark non-fiction book, although the light at the end of the tunnel was there eventually. "I am you and you are me. We are alone, but not alone. We are trapped by time, but also infinite. Made of flesh, but also stars." Es Summer Abubaker wrote: "Very good review thanks"
Frederik That quote is so good. Good review! "I hate depression. I am scared of it. Terrified, in fact. But at the same time, it has made me who I am. And if – for me – it is the price of feeling life, it’s a price always worth paying. I am satisfied just to be." 2018 — The demon came. 'Twas the year I lost a part of myself. My soul wept and mourned for that someone I once truly cherished — the previous me. Looking into the mirror, I saw nothing but hopelessness, worthlessness, and sadness in those eyes — bereft of joy and love. The demon succeeded — almost. Menacing and taunting, it dragged me helplessly into the insatiable abyss — the unfathomable, frigid depths of the ocean. The agonising pain was consuming every bit of my sanity. And I was left wondering if ever my fall will ever be caught by someone or something. It was definitely my end — as I once saw in my dreams, precognition of my own death, my finality. As the demon plunged me into the murkiest depths, I told myself I needed to go back to where I came from. This is not the coda I was expecting and yet, the proverbial light seemed to be receding. Yes, it was dragging me into its deeper, darker, and suffocating embrace muting and subduing all the prismatic colours that once enveloped me. A part of me died and no one could ever notice because "the weirdest thing about a mind is that you can have the most intense things going on in there but no one else can see them." All hope was nearly lost, yet I clung to that spark of light, saving most parts of myself that are slowly disintegrating and dissipating into that vast expanse of infinite darkness. "If you have ever believed a depressive wants to be happy, you are wrong. They could not care less about the luxury of happiness. They just want to feel an absence of pain. To escape a mind on fire, where thoughts blaze and smoke like old possessions lost to arson. To be normal. Or, as normal is impossible, to be empty." And now, here I am. Not the same and never will be, but now stronger and still keeping the demon at bay. Well, I think "it" is going to be a part of me anyway, being an empath and a highly sensitive individual all my life. Reading this book gave me comfort, offered hope, validated my experience, and made me accept things that I cannot change and still be hopeful and stop "worrying about worrying" and all that. My sincerest gratitude to Matt Haig for sharing his story with such remarkable candour. This is a book that is meant to be read by everyone — for those who wanted to understand what depression/anxiety is, for those whose light has been consumed by the darkness but are still looking for the momentary spark that will truly guide them into the light and out of the blue; and for those who are carers of depressed individuals. "Depression is an illness. Yet it doesn’t come with a rash or a cough. It is hard to see, as it is generally invisible. Even though it is a serious illness it is also surprisingly hard for many sufferers to recognise it at first. Not because it doesn’t feel bad – it does – but because that bad feeling seems unrecognisable, or can be confused with other things." Like Haig, I also write and read to escape, know myself, broaden my perspective, and it's my way of resisting and restraining the demon. "One cliché attached to bookish people is that they are lonely, but for me, books were my way out of being lonely. If you are the type of person who thinks too much about stuff then there is nothing lonelier in the world than being surrounded by a load of people on a different wavelength. [...] Books were about movement. They were about quests and journeys. Beginnings and middles and ends, even if not in that order. They were about new chapters. And leaving old ones behind." You might ask me, what keeps you going? Well, having a fictional hubby like Dean Winchester inspires me, what more if I can find an actual Dean Winchester in this reality called life? At least, that is one of my Reasons to Stay Alive. Life is still full of possibilities even if some are quite implausible. And please remember, whoever is reading this, you are, definitely, not alone! "Words, just sometimes, can set you free." This book has been an incredible read. I am not sure if there is an ancient saying about this, but this book surely appeared when the reader needed it. Matt Haig's Reasons To Stay Alive is just wonderful. It brought many bright rays of hope and sunshine, at a time when life's become so very uncertain and it seems to be all about getting through one day at a "Words, just sometimes, can set you free." This book has been an incredible read. I am not sure if there is an ancient saying about this, but this book surely appeared when the reader needed it. Matt Haig's Reasons To Stay Alive is just wonderful. It brought many bright rays of hope and sunshine, at a time when life's become so very uncertain and it seems to be all about getting through one day at a time. This is one of those books which I shall be rereading and referring to, during the rest of my life. "The storm ends. Believe me." "I am you and you are me. We are alone, but not alone. We are trapped by time, but also infinite. Made of flesh, but also stars. I can't imagine why I never knew about this author before! It's a sure must read and a One of the most beautifully written books I have ever read. Inspiration almost drips off the pages. It's honest and vivid enough to make difference even for people who have done no personal trips to the hellish planet of Depression. Let me be honest, I started reading this and thought "This book isn't written for me". But then I thought "There are people I would like to read this, because it feels so familiar to me." I would like to give it to people who are close to people with depression and anxiety, but don't really under I won this proof on twitter from Matt and though I don't often review books here, I thought that probably I owed him that. Not just for giving me a free copy, but for writing the book in the first place. "Now, listen. If you have ever believed a depressive wants to be happy, you are wrong. They could not care less about the luxury of happiness. They just want to feel an absence of pain. To escape a mind on fire, where thoughts blaze and smoke like old possessions lost to arson. To be normal." A meaningful book about depression, anxiety, and creating reasons to stay alive. Like a modern day William Styron, Matt Haig shares his experience with depression and anxiety and how he fought to overcome su "Now, listen. If you have ever believed a depressive wants to be happy, you are wrong. They could not care less about the luxury of happiness. They just want to feel an absence of pain. To escape a mind on fire, where thoughts blaze and smoke like old possessions lost to arson. To be normal." "But actually, it wasn't easy. The weird thing about depression is that, even though you might have more suicidal thoughts, the fear of death remains the same. The only difference is that the pain of life has rapidly increased. So when you hear about someone killing themselves it's important to know that death wasn't any less scary for them. It wasn't a 'choice' in the moral sense. To be moralistic about it is to misunderstand." I loved the insight Haig shared about depression. His view on resisting medication while seeking treatment resonated with me: of course you would use medication if you have to, but you can also learn to breathe on your own - depending on your condition - without the influence of pharmaceutical companies. I also appreciated his emphasis on mindfulness and breathing. We live in such a fast-paced world that feelings of aloneness and worry about emails, meetings, and deadlines seem natural. Haig encourages us to take a step back and give ourselves time for self-care. If you’re easily triggered by descriptions of other people’s mental illnesses, I would advice against reading this during low points. There’s some very in-depth descriptions of his dark thoughts and the panic and depression he felt, and it was really uncomfortable to confront. I think the title misled me because I picked this book up on a bad night hoping it would be uplifting, but I almost immediately had to put it back down when I realized it wasn’t going to help at all, just add to my spiraling. So definitely pick this up when you feel emotionally stable enough to confront very real descriptions of mental illness. Matt talks several times about how he doesn’t take medication and it scares him and he doesn’t want to, which is a personal choice and that’s fine, but there are so many people that do take meds and it works for them, and if I would have read this before getting on my anxiety medication, it probably would have scared me away from it even further than I already was. Anyone who suffers from anxiety and depression will understand just how horrific and truly debilitating it can be . This book is excellent for anyone who has no idea how a family member or partner suffers. Hope you are still doing well Matt and what an absolutely fantastic supportive wife you have. So good that it should be required reading. In schools. For GPs. Everyone. Haig says that each mind breaks differently, but I think his heartfelt words will say/mean something to anyone who has felt anxiety or depression. Some sections were so real that I had to put the book aside for a while. It's brilliant and hopeful. My thanks to Matt Haig for sharing so much of himself. It's not something most of us are able to do. Whether you have a large black dog lumbering behind you, or a playful puppy bounding by you side, your mental health is one of your greatest assets. It is more delicate than the most intricate Swiss watch. We often don’t think of it too much, until things go skewiff. It’s something we take for granted, like the sun rising and setting. I adore Matt Haig’s writing. He is empathetic. He doesn’t preach. He is real. And he’s darn amusing (whether intentional throughout this book or not…I guess that’s where the phrase “black humour” comes from). There are so many “ah-ha” moments in the book, that I could relate to. From minor niggles to major problems, Matt Haig discusses the insidiousness of mental health. How because it can’t be seen, it can be difficult to diagnose the fine line of having “one of those days” to actually having deeper issues which need resolving. A fabulous book. It spoke to me on so many levels. It had my mind racing in a thousand different directions reading it. And it brought a lump to my throat more than once. This is more profound than most of the “esteemed” self-help books out there. I'll end this review with some more words from Matt Haig about depression, which are utterly beautiful. ”It may be a dark cloud passing across the sky, but - if that is the metaphor - you are the sky. You were there before it. And the cloud can't exist without the sky, but the sky can exist without the cloud." Not too long ago I was approached by Canongate about this book. They had seen that I made a recommendation video on my YouTube channel for books relating to mental health and because of this they thought I would enjoy this book. Mental health awareness is something I consider to be of the utmost importance - having suffered with depression and anxiety from a young age this is definitely a topic I hold dear to my heart. Now I have to be honest - I'm not one for reading non-fiction, in fact last ye Not too long ago I was approached by Canongate about this book. They had seen that I made a recommendation video on my YouTube channel for books relating to mental health and because of this they thought I would enjoy this book. Mental health awareness is something I consider to be of the utmost importance - having suffered with depression and anxiety from a young age this is definitely a topic I hold dear to my heart. - Where do I begin?! This book was simply wonderful, heart-breaking and a real thought provoker. I don't think I can even efficiently describe this book to get across the beauty and significance of it. - So this is a biographical novel written by the author Matt Haig; Matt is telling us the story of his descent into depression and anxiety at the age of twenty four. We learn of how Matt contemplated suicide and how he could barely leave the house due to the anxiety, a lot of this resonated with me and I found myself nodding along with various anecdotes from Haig's childhood that I also had very similar experiences of. I think this is a book that will mean a lot of things to a lot of people. Either you can see this in yourself or you can see it in someone you love - I believe this book could be of great help to sufferers and supports alike. - I think this book will definitely be an eye opener to anyone who sees depression and anxiety as just being 'a little bit sad' or just 'over-worried' - Haig is wonderfully articulate in the way he describes the despair and panic that comes along with these mental illnesses and I commend him on sharing his extremely personal story. Mental health is a difficult topic to discuss, especially when you are in the midst of it - in myself I can see that when I look back now I have a much greater understanding of my state of mind and have learnt how to cope with similar feelings in the future. - There are so many things I could say about this book, I plan to go back through and underline all of the things I absolutely loved - I read this book on a train journey to London and only had my phone so just took pictures of the quotes that really resonated with me. - I would highly recommend this book to all, if you are a sufferer or if you know someone who has or is suffering (and I'm willing to bet you do) then this book is for you. Truly eye-opening and something that I think would bring hope to those who are currently feeling lost - I think if I had read something like this during my darkest times I would have really benefitted from the hope that radiates from this story. I'm so conflicted, and I feel really bad rating this two stars. Maybe it's more like a 2.5 for me? I do genuinely appreciate a lot of things about this, but at the same time I just couldn't connect. Honestly, if you're planning to read this - my lack of enjoyment over this book is probably a 'me-problem' and you should just go for it. I'm just not one of the people who 'get' this book, I guess. - Matt Haig brought up books a lot. I u I'm so conflicted, and I feel really bad rating this two stars. Maybe it's more like a 2.5 for me? - Matt Haig brought up books a lot. I understand this, and books help me cope so these were the moments where I went "yes! I know what you're talking about, I understand you, this is nice." - There's a section about seeking help at the end of the book. It's a lovely addition. - I don't know how he got better. I feel like that's the most important thing - because we all know (kind of) how we got to that lowest point - it's getting out of that ravine that makes me interested in a person's story. So yeah. I want to know how. - The talk about antidepressants. They help so many people, and I realise Matt said that the fact that they didn't work for him doesn't mean that they won't work for other people. BUT all of this is so stigmatised, and I felt like he was downplaying the importance of medication, I guess? - Also... there were just a lot of little things that irked me. I'm going to stop listing things, because it makes me feel mean. I'm really critical about these things, and I'll probably end up discussing this on my blog at some point because this is such an important issue to me. Rachel Just found your review and I feel exactly the same, right down to the guilt for not loving the book as much as I ‘should’. But I couldn’t get past the Just found your review and I feel exactly the same, right down to the guilt for not loving the book as much as I ‘should’. But I couldn’t get past the medication downplay and the lack of any real explanation of his recovery. I’m so glad this book helps people, but my depression was very much an abyss that only medication and therapy was going to help. It really played on my mind that friends who I know won’t go to the doctor for fear of mental health stigma might read a book like this and presume waiting it out is going to be enough. Annika Aww I'm glad to hear you feel the same, Rachel. I honestly don't want to seem overly critical of anyone's experience or them sharing and writing about Aww I'm glad to hear you feel the same, Rachel. I honestly don't want to seem overly critical of anyone's experience or them sharing and writing about it but at the same time I can't really recommend this to friends with mental health issues. Maybe people who don't suffer mental illness will get more out of it? I worry about the same thing, honestly, and I'm always reminding friends with similar issues to mine to go back to their GP and discuss their meds etc. Because I still find it hard after nearly a decade on and off meds. I feel like this book is a friend I very much needed. I enjoyed reading this. It was such an honest and personal account of what Matt Haig went through. I could really relate to this but reading some parts were hard because of that. I kind of wish I read this when I was in a better mental space because I might have gotten more out of it but I think he did a really good job. I especially liked a passage that I have highlighted below about depression (I marked it with a * to differentiate it from the other quotes). I hope more people come f 3.5 stars. I hope more people come forward and feel brave enough and safe enough to share their stories of what it is like to have depression, OCD, bipolar disorder, anxiety, etc because I would love to read more books like this one. I would recommend it but I think you should be in a good headspace at that moment. I would also read more by Haig. "One of the key symptoms of depression is to see no hope. No future. Far from the tunnel having light at the end of it, it seems like it is blocked at both ends, and you are inside it." "'But in the end one needs more courage to live that to kill himself.' - Albert Camus, A Happy Death"
"I was a failure. A quitter. I had nothing at all on the horizon. I was sliding down, becoming vulnerable to an illness that was waiting in the wings. But I didn't realise it. Or I didn't care. I was just thinking of escape." "The main thing is the intensity of it. It does not fit within the normal spectrum of emotions. When you are in it, you are really in it. You cant step outside it without stepping outside of life, because it is life. It is your life. Every single thing you experience is filtered through it. Consequently, it magnifies everything. At its most extreme, things that an everyday normal person would hardly notice have overwhelming effects." "What doesn't kill you can make you scared to leave your house, or even your bedroom, and have you trembling, or mumbling incoherently, or leaning with your head on a window pane, wishing you could return to the time before the thing that didn't kill you." "And my life - and my mess of a mind - needed shape. I had 'lost the plot'. There was no linear narrative of me. There was just mess and chaos." "If you are the type of person who thinks too much about stuff then there is nothing lonelier in the world than being surrounded by a load of people on a different wavelength." "Derealisation. It is a very real symptom that makes you feel, well, not real. You don't feel fully inside yourself. You feel like you are controlling your body from somewhere else." A thoughtful, witty and comforting approach to depression. I would've liked a little more hard science in this, but the author's right to say that our understanding of the brain is in the early stages, and to a sensible degree, we have to find what works for us. Throughout the book, we're offered avenues to explore that. I'd particularly recommend this book to family and friends of the sufferer, as it explains depression very well, but there's plenty in here for veterans of the struggle. Depression rates are even higher among medicine students than the general populations. And because there is a stress from the subject itself, from our daily struggles and from dealing with illness and death and the everlasting torment from the faculty, we sometimes need a reminder! The story of how Matt Haig came through crisis, triumphed over a mental illness that almost destroyed him and learned to live again. I wouldn’t say this book was revolutionary in any way, nor did it teach me anything I didn’t already know about depression and anxiety. However, Matt Haig writes in such an inspiring and hopeful way that I still thoroughly enjoyed this book. These “self-help” or memoir books can begin to become boring or feel tedious if they are written in a certain way - if there’s walls and walls of texts for example. But Haig has laid his book out in a really easy to read format, he flits back and forth between his past and present and there’s sections that simply consist of lists of things like “ways to live” or “things that make me feel worse” to tweets from different people describing what depression feels like to them. It keeps the book fresh and interesting, and very easy to devour. He also refers to Stephen King on a number of occasions which obviously made me very happy! You can tell Haig loves reading and there’s some really beautifully written sections where he talks about the influence books can have on our lives and mental health. He even includes a list of books that he turns to on his darker days. The book focuses a lot more on depression than anxiety, and as someone who has (fortunately) never suffered from depression, I couldn’t personally relate to large chunks, however I could certainly understand and empathise. I would therefore strongly recommend this to those who are battling depression - or even to those who love someone battling depression. The more we try to understand each other, the more we can tackle the stigma surrounding mental health. A fuller review MAY follow but my initial reactions to this book, just after finishing it, you can find here. It is ironic (is that the right word I wonder?) that the author who gave me my first reason to stay alive, at a time when I struggled to find one - with his previous novel, The Humans - then went on to write openly, elegantly and with no holds barred, about his own experiences of depression and anxiety. 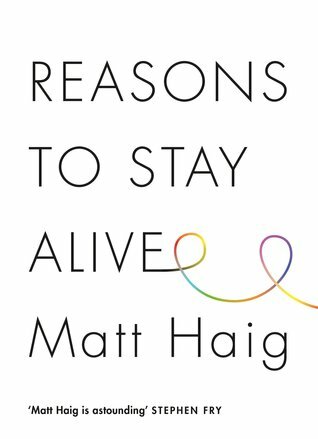 And called it "Reasons to Stay Alive" If I was better with words myself I could probab A fuller review MAY follow but my initial reactions to this book, just after finishing it, you can find here. It is ironic (is that the right word I wonder?) that the author who gave me my first reason to stay alive, at a time when I struggled to find one - with his previous novel, The Humans - then went on to write openly, elegantly and with no holds barred, about his own experiences of depression and anxiety. And called it "Reasons to Stay Alive" If I was better with words myself I could probably find a better one than Ironic. But it will have to do. I would normally at this point I guess, wax lyrical about how beautifully Mr Haig writes and how he gets me every time. Which is true of course, but not what this book needs. I've read a lot of non fiction about Depression and related issues during the time that I have been trying to understand my own mindset, my own experience, but what Matt has done is simply talk about it honestly. In the end, if you want to try and understand it, this is what you need - open, frank and truthful words that paint a picture and allow you in. I shall be keeping a copy of it close by for sure, for the next 3am where I think perhaps dying would be better. I've given it 5 stars obviously, but this is not a book to be rated. It is one to be read - by anyone who suffers, has suffered, lives with someone who suffers and ALL the people in between - one of the most important books you may ever read about the human condition. Brave, sincere, genuine and inspirational. That is all. Matt Haig is an amazing writer. This is the first nonfiction book I’ve read from him, he wrote my favorite book I read last year: The Humans. But this book is really great and really important. It’s a book about his depression and anxiety and it’s partly the story of how he tried to kill himself and how he overcame that, but there’s also some really insightful facts about depression and anxiety and metaphors and lists of reasons to stay alive, and just a lot of really inspiring hopeful things in Matt Haig is an amazing writer. This is the first nonfiction book I’ve read from him, he wrote my favorite book I read last year: The Humans. But this book is really great and really important. It’s a book about his depression and anxiety and it’s partly the story of how he tried to kill himself and how he overcame that, but there’s also some really insightful facts about depression and anxiety and metaphors and lists of reasons to stay alive, and just a lot of really inspiring hopeful things in this book. Wait about my video about mental illness, this book made me decide to do it, to come out and dare to say it outloud, yes I have depression and anxiety disorder, I am fighting them everyday, and I relate to every single thing in this book (even though there are some differences). Gonna talk to you soon about it all. till then, keep fighting, keep hoping. Life is not as bad as it may seem some days! Finally, mental challenges discussed from the POV of someone who's survived and continues to surmount. It's also a sort of 'behind-the-scenes' to my most recent fave novel, "The Humans." The author does a fine job of performing the audiobook. This was really good. I almost read it in one sitting, every time a 'chapter' ended, I wanted to continue. I got this for christmas and, as I am dealing with an anxiety disorder and depressive episodes, I wanted to read this for quite some time but I didn't know what to expect. And even now after reading it, I can't properly tell you what it's 'about'. For me, this was an explanation of depression, a help for those who are suffering from it but also to those who are close to someone with a depression, and an homage to life really. Matt Haig gives you a little hope how life can really get better, even if it really doesn't seem like it sometimes. He is also quoting quite a lot of other authors, which I found interesting. It's a guide but not in an annoying 'here I'll tell ya what to do with your disorder" way, more in a 'hey, I know every mental disease is different but I got through it and so will you' way. He never really says how exactly he came over his worst depressive episode, but that didn't bother me in the slightest way. Just like a depression happens to you, healing can also just happen to you. 1) You have suffered/ are suffering depression and/or anxiety. 2) You know someone who has suffered/ is suffering depression and/or anxiety. If you’re asking the question “Is this book for me?”, then the answer is simply, statistically speaking, that this book is for everybody. There isn’t a single person who wouldn’t benefit from the candid insights and sincerity it contains. Matt Haig has given us a book that is half memoir, half life raft, spoken with a voice that combines honesty with wit, humour and tenderness. ‘Reasons to Stay Alive’ is far from maudlin, or pontificating. It’s not ‘heavy’, or overly-academic. It is short, matter-of-fact, a lot of which is constructed so that it can be digested just one single page at a time. This book doesn’t set out to define anxiety and depression, but Matt Haig has a way of articulating his own experience that will resonate deeply. ‘Reasons to Stay Alive’ will make you laugh and cry. It’ll make you wish for more Andreas in the world. It is, without doubt a Very Important Book. This is a fantastic book. I've been meaning to read it for a long time, but it was certainly worth the wait! I suffer from the illness myself, and this book is so much better than most self-help books. Travelling through, Matt Haig's journey and experience with severe anxiety and depression, this account manages to portray an understandable and readable insight into the illness. If you suffer from this or know someone who does, this book is an essential read. Even if you don't, it still makes for This is a fantastic book. I've been meaning to read it for a long time, but it was certainly worth the wait! I suffer from the illness myself, and this book is so much better than most self-help books. Travelling through, Matt Haig's journey and experience with severe anxiety and depression, this account manages to portray an understandable and readable insight into the illness. If you suffer from this or know someone who does, this book is an essential read. Even if you don't, it still makes for brilliant reading. Short and sweet review, but absolutely outstanding! Highly recommended.